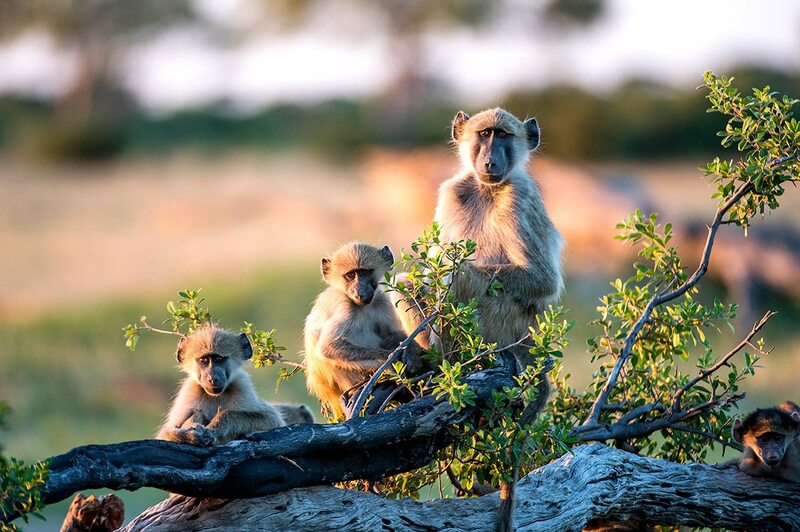 As a nation, Zimbabwe is forward-thinking enough to have set large areas of pristine wilderness – like Mana Pools and Hwange – aside as national parks, yet still has one eye on its intriguing past. Colonial-era buildings fit into luxury Zimbabwe safari itineraries alongside comfortable lodges that employ sustainable technology to ensure a brighter future. Two very different encounters with the Zambezi River at Victoria Falls and Mana Pools juxtaposed with Hwange, where water is a much scarcer commodity, and yet the game viewing is every bit as spectacular as alongside the Zambezi. 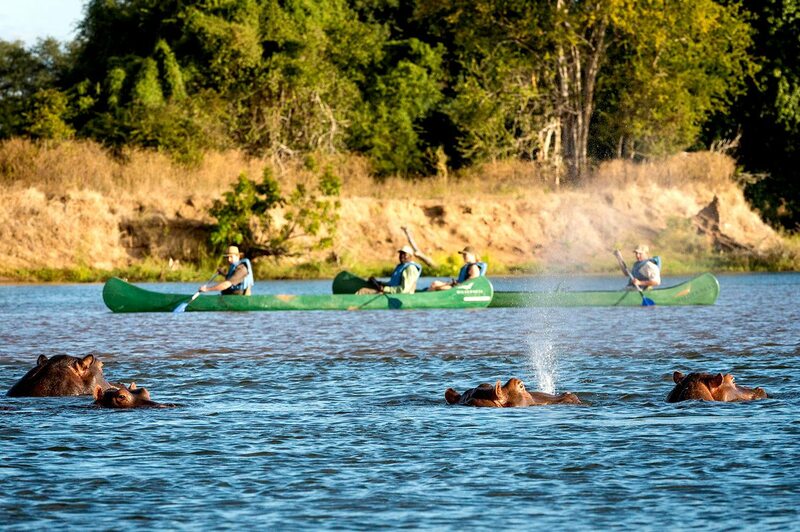 Opportunities to see huge herds of animals in northwest Zimbabwe, drive along the Zambezi River, enjoy a canoe safari on the Zambezi, sleep under the stars on sleep-out deck, microlight over Victoria Falls and cruise the Zambezi at sunset. Luxury tented camps on raised platforms, with shared pools, at Ruckomechi and Linkwasha contrast with the Edwardian ‘wedding cake’ architecture of Victoria Falls Hotel. 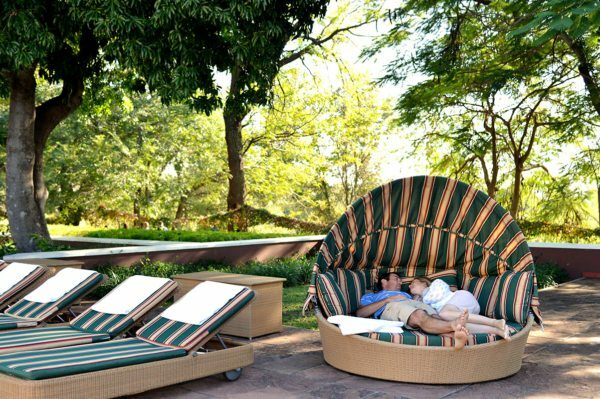 Both luxury lodges overlook busy waterholes, while some rooms at the hotel overlook the iconic iron bridge and gorge. For more information see Linkwasha Camp, Ruckomechi Camp and Victoria Falls Hotel. 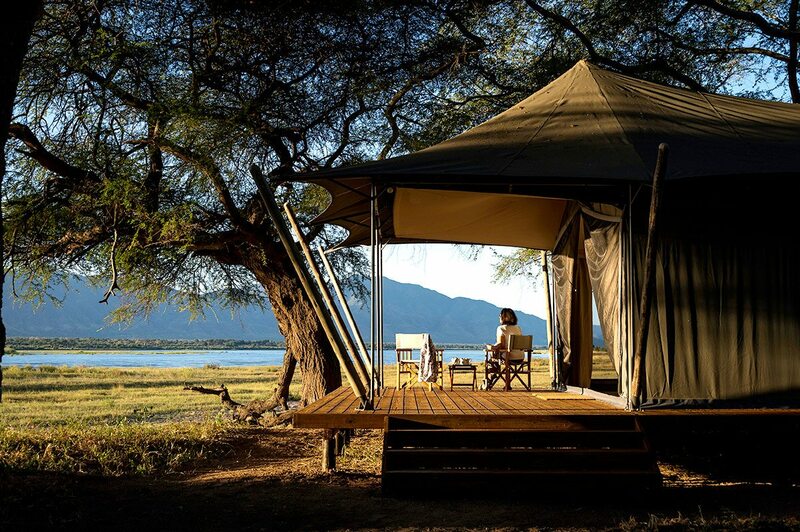 Linkwasha Camp’s reputation for excellent year-round game viewing had made it a must-see destination for us, and for once a place exceeded its reputation. We encountered a small herd of elephant on the short drive from the airstrip, and watched more drink at the waterhole in front of the main area. That afternoon, just minutes into our first official Hwange game drive, we realised we’d arrived somewhere truly special. Our first buffalo herd was so large that it almost felt as though we were fording a brown river as they moved around us, and beyond them in the savannah were zebra and eland. Committing the ultimate safari crime and having a ‘sleeping safari’ (a naughty lie-in) on our second day felt rather wonderful, and of course no one judged us for it. The sleep part was fantastic, while the safari component was also deeply satisfying as – thanks to the floor-to-ceiling glass doors to our tent – we didn’t miss a (hoof) beat of the passing game. Over brunch in the open, airy main area, we continued to scan our surroundings and were rewarded with our first sighting of sable. We headed out for sundowners that segued into a night drive, haunted by the ghostly grey shapes of elephant in the darkness. During the early hours of our third morning, we’d been awakened by elephant having an animated discussion as to who was to drink from the waterhole first, and for our morning game drive our guide took us to several more of their favourite watering spots. It turned out that little elephant enjoy waterholes as much as big ones, if not more so! Later, we took an afternoon dip in the lodge pool, where – astonishingly but unthreateningly – we were joined by a bull elephant. Or rather, we were joined by the tip of his trunk as he drank from the pool while we were in it! 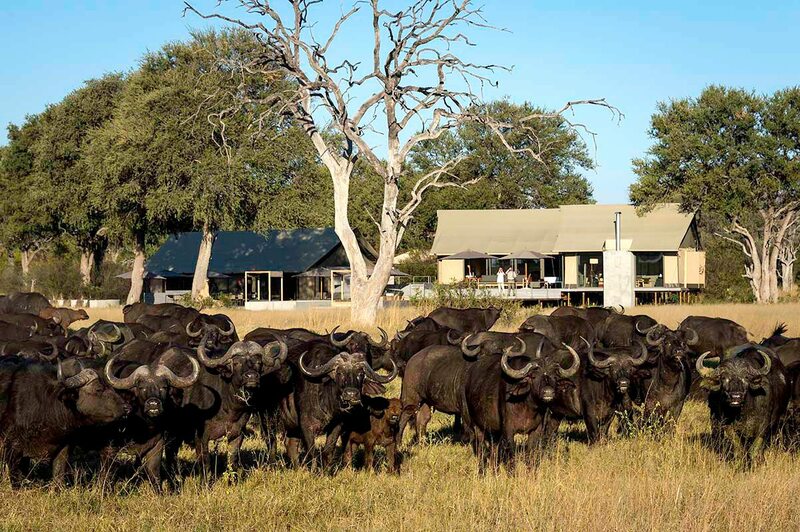 Linkwasha Camp’s reputation for excellent year-round game viewing had made it a must-see destination for us, and for once a place exceeded its reputation. We encountered a small herd of elephant on the short drive from the airstrip, and watched more drink at the waterhole in front of the main area. That afternoon, just minutes into our first official Hwange game drive, we realised we’d arrived somewhere truly special. Our first buffalo herd was so large that it almost felt as though we were fording a brown river as they moved around us, and beyond them in the savannah were zebra and eland. Committing the ultimate safari crime and having a ‘sleeping safari’ (a naughty lie-in) on our second day felt rather wonderful, and of course no one judged us for it. The sleep part was fantastic, while the safari component was also deeply satisfying as – thanks to the floor-to-ceiling glass doors to our tent – we didn’t miss a (hoof) beat of the passing game. Over brunch in the open, airy main area, we continued to scan our surroundings and were rewarded with our first sighting of sable. We headed out for sundowners that segued into a night drive, haunted by the ghostly grey shapes of elephant in the darkness. During the early hours of our third morning, we’d been awakened by elephant having an animated discussion as to who was to drink from the waterhole first, and for our morning game drive our guide took us to several more of their favourite watering spots. It turned out that little elephant enjoy waterholes as much as big ones, if not more so! Later, we took an afternoon dip in the lodge pool, where – astonishingly but unthreateningly – we were joined by a bull elephant. Or rather, we were joined by the tip of his trunk as he drank from the pool while we were in it! Our light aircraft flight to Mana Pools in part followed the line of the Zambezi River where it marked the boundary between Zimbabwe and its northern neighbour, Zambia. We looked forward to getting better acquainted with the river when we landed. 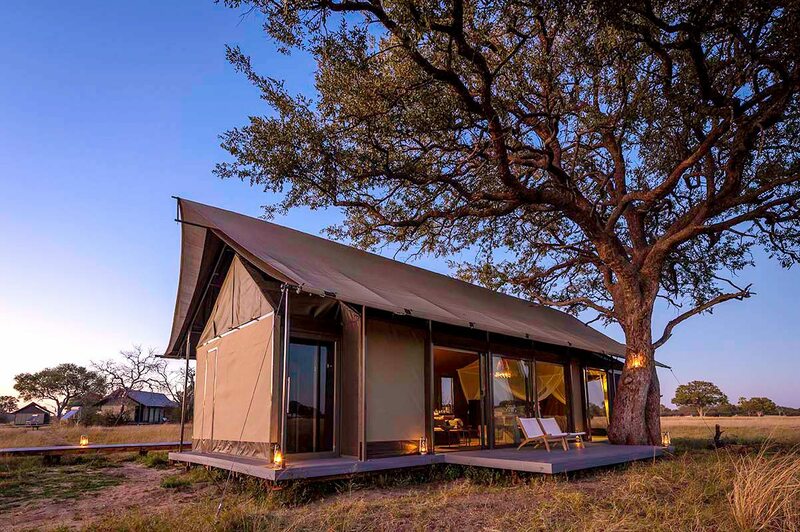 If there’s a luxury lodge in Zimbabwe with a more spectacular setting than Ruckomechi Camp, we’ve yet to find it. 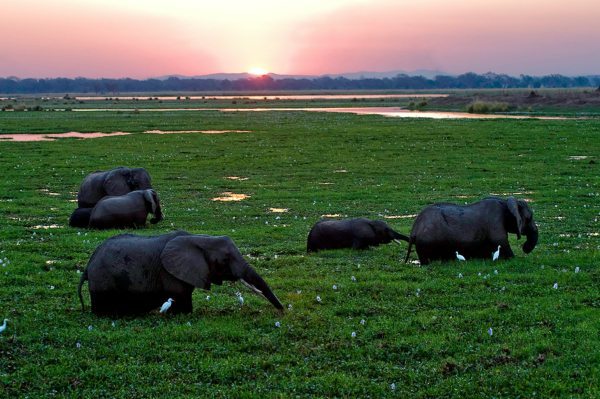 It turned out, however, that the views across the Zambezi River to the mighty Rift Valley Escarpment on the Zambian side would be overshadowed by the amazing wildlife we saw there. I’d read somewhere that you should never climb a tree if chased by an elephant, and seeing just how high they could reach into the towering albida seeds showed me why. Our afternoon safari beside the Zambezi River let us see more elephant up close as we explored. The next morning my partner chose to go fishing, and went out with our guide on a pontoon boat on the Zambezi. Their quarry was the infamous tiger fish, and I pre-emptively celebrated their success with a lot of bubbles. That’s right – I was shown to Ruckomechi’s legendary secluded outdoor bathtub, which had already been filled for me. I lay there in glorious isolation, watching kingfishers plummet into the river and emerge with fish. My partner had also been successful, although the fish in the pictures (which had been released) looked to be more Tigger than Shere Khan. I joined my partner on the water for a canoe safari on our third morning here, which gave us a different perspective on the landscape and wildlife. Floating silently just metres away from elephant hoovering up albida pods was a special experience. Our guide led us along the river in complete safety (heading downstream, so we barely had to paddle) until we arrived at a picnic spot where our brunch was waiting. He then drove us back to Ruckomechi, and, later, to Parachute Pan, to the very romantic sleepout platform where we spent the night. Our light aircraft flight to Mana Pools in part followed the line of the Zambezi River where it marked the boundary between Zimbabwe and its northern neighbour, Zambia. We looked forward to getting better acquainted with the river when we landed. If there’s a luxury lodge in Zimbabwe with a more spectacular setting than Ruckomechi Camp, we’ve yet to find it. 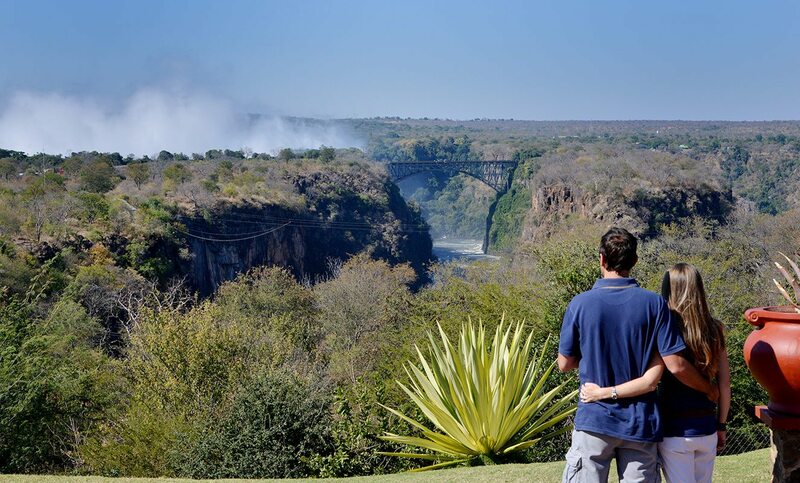 It turned out, however, that the views across the Zambezi River to the mighty Rift Valley Escarpment on the Zambian side would be overshadowed by the amazing wildlife we saw there. I’d read somewhere that you should never climb a tree if chased by an elephant, and seeing just how high they could reach into the towering albida seeds showed me why. 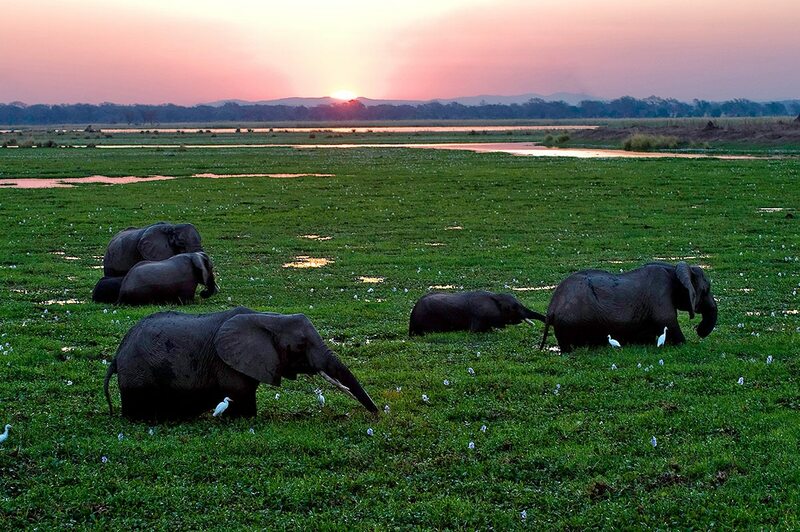 Our afternoon safari beside the Zambezi River let us see more elephant up close as we explored. 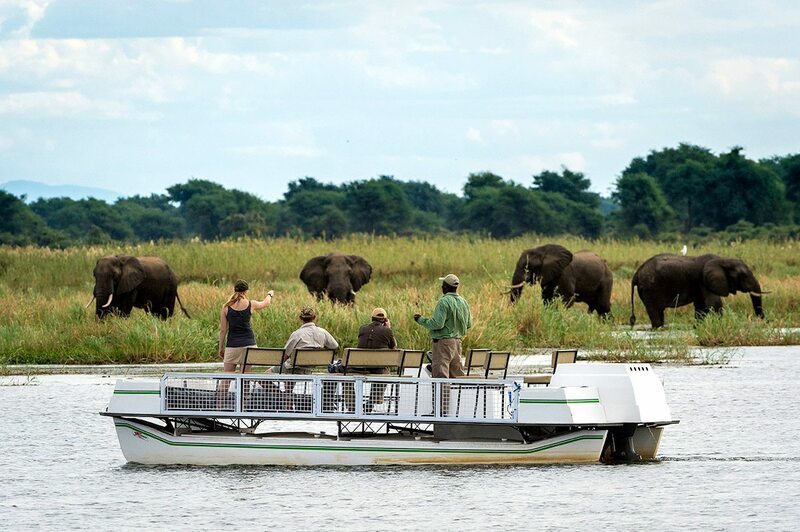 The next morning my partner chose to go fishing, and went out with our guide on a pontoon boat on the Zambezi. Their quarry was the infamous tiger fish, and I pre-emptively celebrated their success with a lot of bubbles. That’s right – I was shown to Ruckomechi’s legendary secluded outdoor bathtub, which had already been filled for me. I lay there in glorious isolation, watching kingfishers plummet into the river and emerge with fish. My partner had also been successful, although the fish in the pictures (which had been released) looked to be more Tigger than Shere Khan. I joined my partner on the water for a canoe safari on our third morning here, which gave us a different perspective on the landscape and wildlife. Floating silently just metres away from elephant hoovering up albida pods was a special experience. Our guide led us along the river in complete safety (heading downstream, so we barely had to paddle) until we arrived at a picnic spot where our brunch was waiting. He then drove us back to Ruckomechi, and, later, to Parachute Pan, to the very romantic sleepout platform where we spent the night. As our flight approached Victoria Falls, the pilot pointed out the window, although with the clouds of white spray billowing above them, his act of kindness was probably unnecessary. We were delighted with the view from our luxury suite: we could see part of the famous iron bridge, and down into the spectacular gorge. 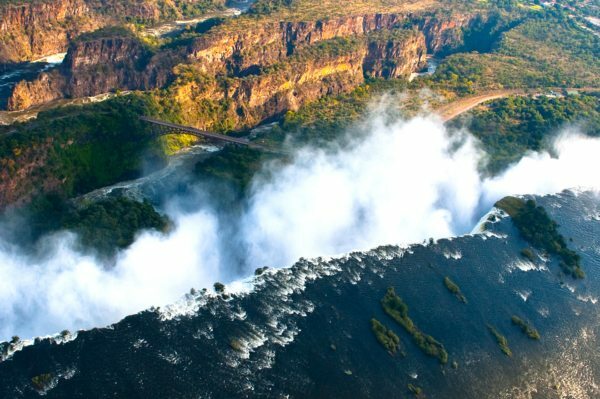 Our flight into Victoria Falls had only sharpened our appetite for more aerial views, and the concierge assisted us with our microlight flight booking. A microlight, it turned out, was essentially an aircraft with all the superfluous details (like doors, floor and roof) stripped way … which of course meant that there was nothing between us and the phenomenal views! A camera attached to the wing snapped away while I simply gawped at the falls. On our second day, we discovered that the manicured gardens of Victoria Falls Hotel were the ideal place to enjoy lunch after our morning walk to the falls. The hotel’s private ten-minute path to the entrance meant that we could bypass the crowds, and then return to the sanctuary of the gardens for tea and sandwiches. As the sun slowly started to sink, we toasted our luxury Zimbabwe safari with crisp gin and tonics, served to us by the crew of our sunset cruise boat. Hippo chortled as the surface of the river reflected the fiery skies, and we experienced a feeling of pure contentment. As our flight approached Victoria Falls, the pilot pointed out the window, although with the clouds of white spray billowing above them, his act of kindness was probably unnecessary. We were delighted with the view from our luxury suite: we could see part of the famous iron bridge, and down into the spectacular gorge. 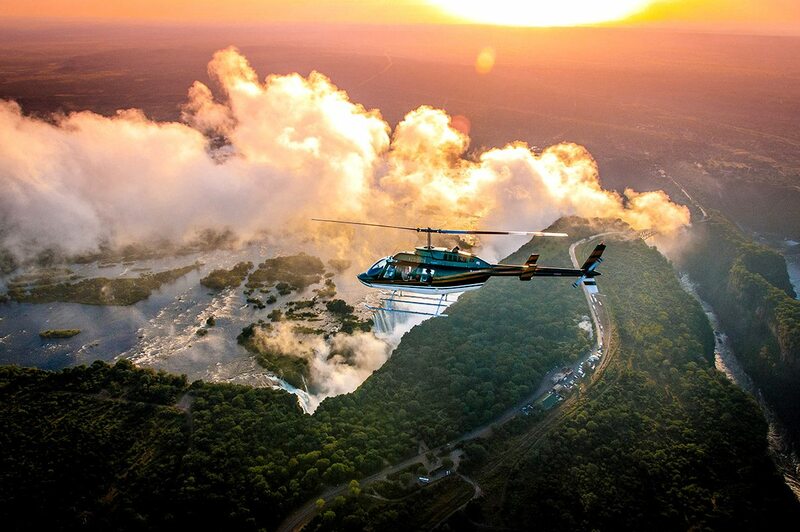 Our flight into Victoria Falls had only sharpened our appetite for more aerial views, and the concierge assisted us with our microlight flight booking. A microlight, it turned out, was essentially an aircraft with all the superfluous details (like doors, floor and roof) stripped way … which of course meant that there was nothing between us and the phenomenal views! A camera attached to the wing snapped away while I simply gawped at the falls. On our second day, we discovered that the manicured gardens of Victoria Falls Hotel were the ideal place to enjoy lunch after our morning walk to the falls. The hotel’s private ten-minute path to the entrance meant that we could bypass the crowds, and then return to the sanctuary of the gardens for tea and sandwiches. As the sun slowly started to sink, we toasted our luxury Zimbabwe safari with crisp gin and tonics, served to us by the crew of our sunset cruise boat. Hippo chortled as the surface of the river reflected the fiery skies, and we experienced a feeling of pure contentment. Our luxury Zimbabwe safari showcased the variety of wildlife, landscapes and experiences that this country has to offer, and also emphasised for us the pride that the people have in their heritage, both cultural and natural. 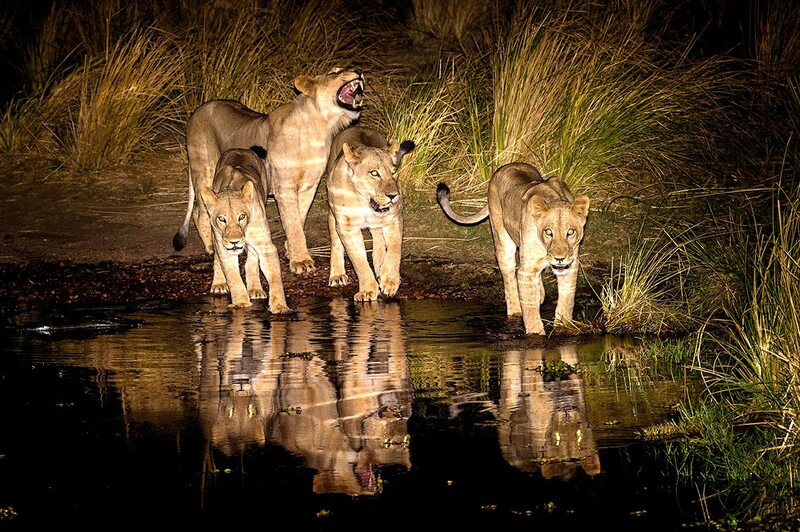 We learned a great deal about the cooperation between the national parks authorities and the luxury lodges when it comes to supporting anti-poaching initiatives and pumping the vital waterholes. The success of these programmes was clear to see, in the profusion of wildlife we saw at almost every turn during our game drives and guided walking safaris in both Hwange and Mana Pools. The beautifully preserved Victoria Falls Hotel illustrated that history is also important here. 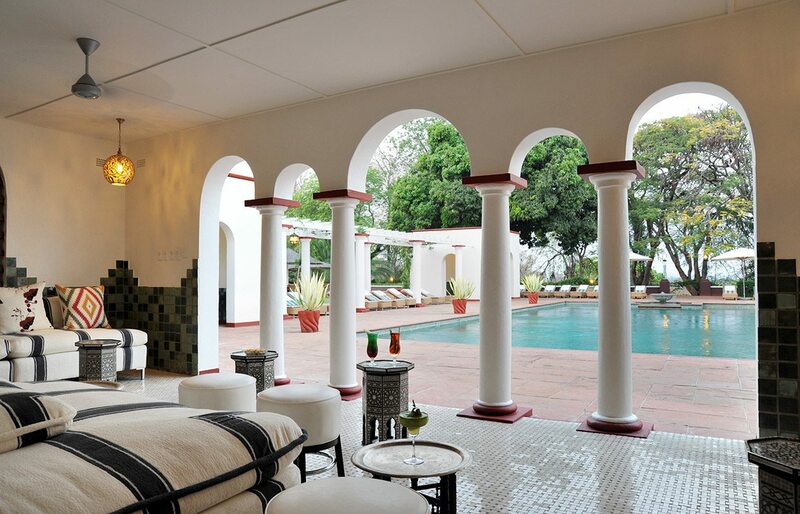 Even though this hotel may have been conceived as part of a grandiose colonial scheme, it’s now become a very Zimbabwean landmark, with warm, genuine smiles enlivening what might otherwise be slightly stiff silver service. Perhaps more than anything else, this safari was for us a wonderful opportunity to indulge our passion for elephant. We’d heard Ruckomechi described as ‘the elephants’ favourite camp’ and it consequently became one of ours. On our Hwange game drives from Linkwasha, we also saw elephant in numbers we hadn’t dare think possible. Arriving in Victoria Falls, we exchanged smiles when our guide described the venerable old hotel as a white elephant. We were sure he was referring to its size and colour, although given that it was built to service a railway line that was never completed, we couldn’t quite be sure! 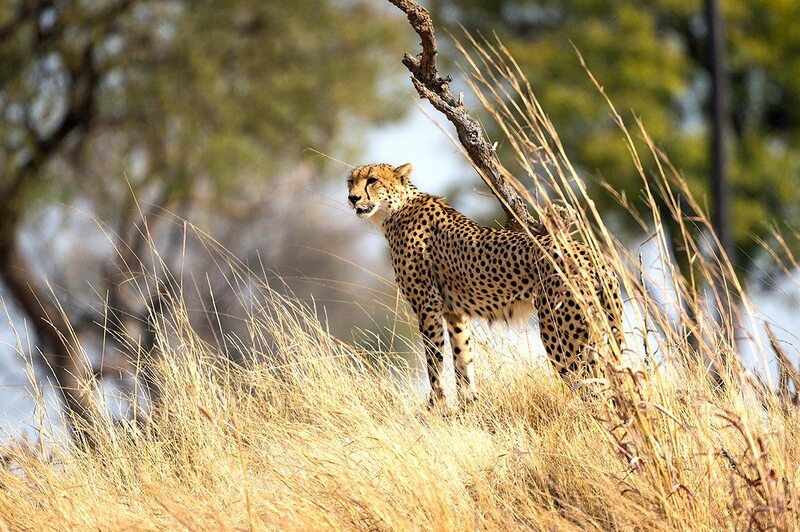 Our luxury Zimbabwe safari showcased the variety of wildlife, landscapes and experiences that this country has to offer, and also emphasised for us the pride that the people have in their heritage, both cultural and natural. We learned a great deal about the cooperation between the national parks authorities and the luxury lodges when it comes to supporting anti-poaching initiatives and pumping the vital waterholes. The success of these programmes was clear to see, in the profusion of wildlife we saw at almost every turn during our game drives and guided walking safaris in both Hwange and Mana Pools. The beautifully preserved Victoria Falls Hotel illustrated that history is also important here. 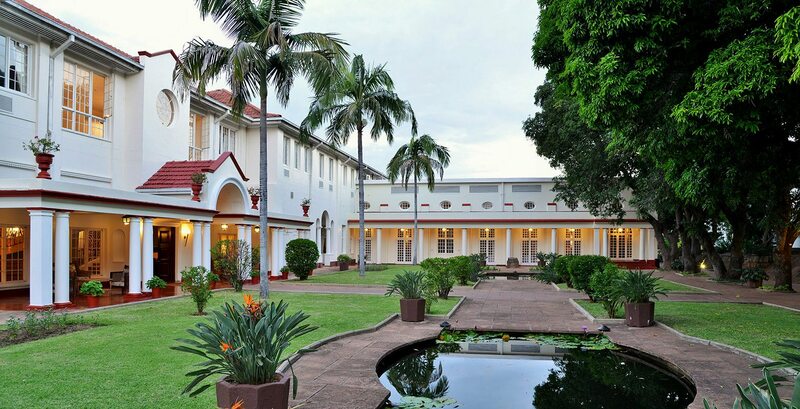 Even though this hotel may have been conceived as part of a grandiose colonial scheme, it’s now become a very Zimbabwean landmark, with warm, genuine smiles enlivening what might otherwise be slightly stiff silver service. Perhaps more than anything else, this safari was for us a wonderful opportunity to indulge our passion for elephant. We’d heard Ruckomechi described as ‘the elephants’ favourite camp’ and it consequently became one of ours. 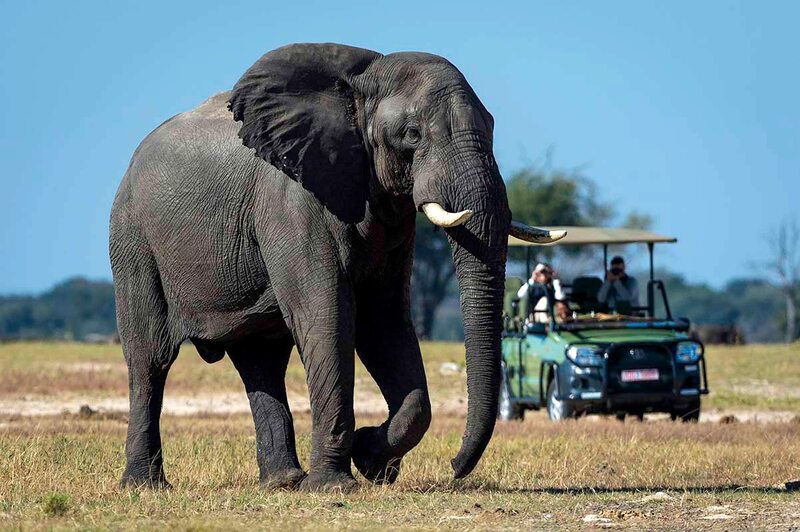 On our Hwange game drives from Linkwasha, we also saw elephant in numbers we hadn’t dare think possible. Arriving in Victoria Falls, we exchanged smiles when our guide described the venerable old hotel as a white elephant. We were sure he was referring to its size and colour, although given that it was built to service a railway line that was never completed, we couldn’t quite be sure! You’ll be met as you disembark from your international flight at Victoria Falls International Airport, and assisted through customs and immigration. After a scheduled light-aircraft flight to Hwange, you’ll take a transfer to Linkwasha Camp, where you’ll spend three nights. After a transfer from Linkwasha Camp to the airstrip, you’ll take a scheduled light-aircraft flight to Mana Pools. A transfer will take you to Ruckomechi Camp, where you’ll spend three nights. After a transfer from Ruckomechi Camp to the airstrip, you’ll take a scheduled light-aircraft flight to Victoria Falls. 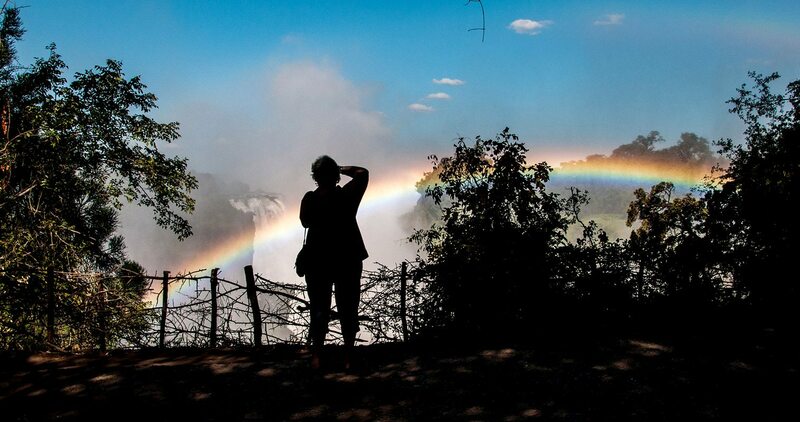 A transfer will take you to Victoria Falls Hotel, where you’ll spend two nights. A transfer will take you from Victoria Falls Hotel to Victoria Falls International Airport, to connect with your international flight. 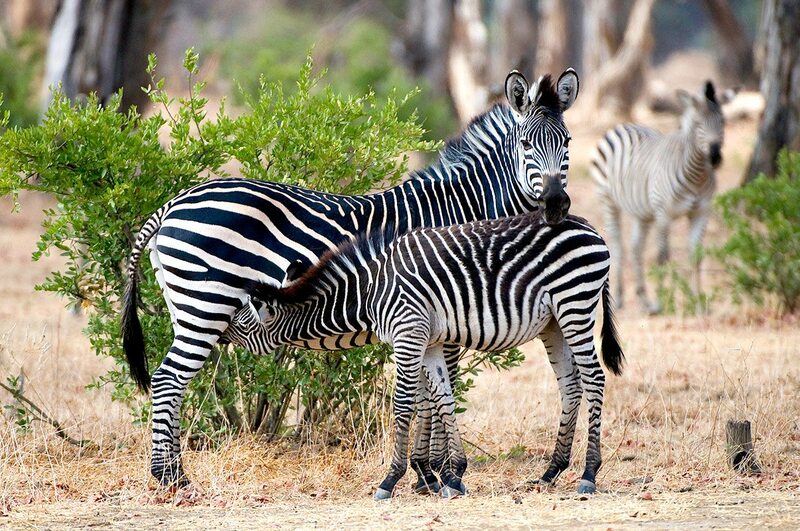 We also offer a curated selection of Zimbabwe & Zambia safari packages, wrapped and priced for your convenience, click here to explore them. 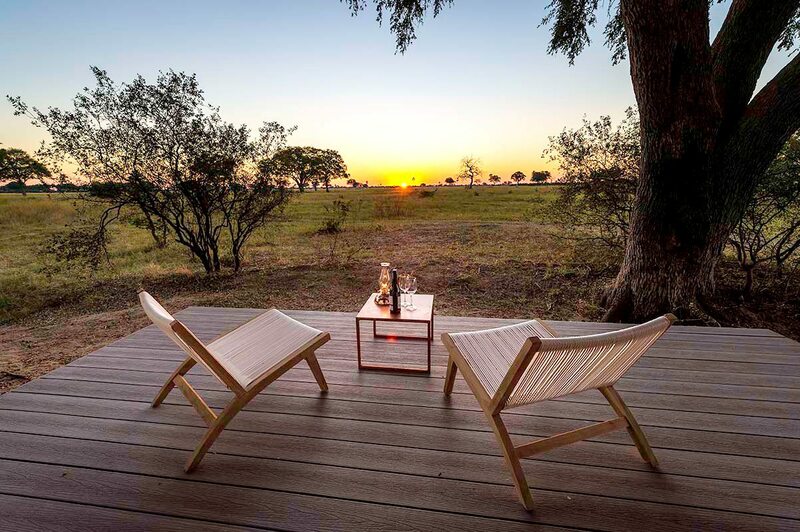 Ruckomechi Camp is a luxury Zimbabwean safari lodge in a remote wilderness concession in western Mana Pools National Park. 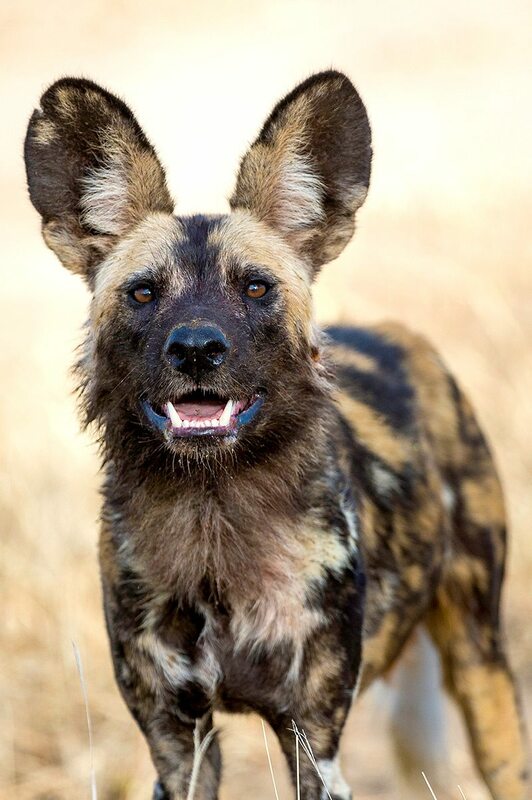 It’s renowned for its dry season wildlife concentrations, and for sightings of wild dog. 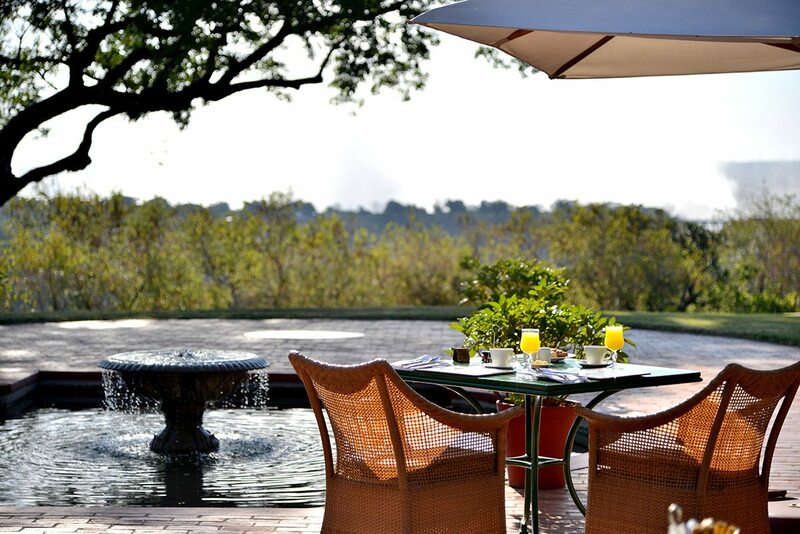 The lodge overlooks the Zambezi River and faces the Rift Valley escarpment on the Zambian bank.